A frightened 19-year-old with an inch of bone sticking from his broken wrist, Anthony Burns was a fugitive slave from Virginia who was caught and arrested in Boston. 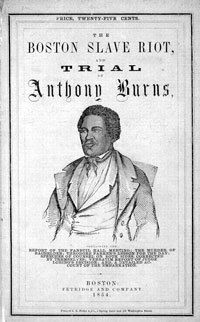 On May 24, 1854, there began a series of hearings in Federal District Court in Boston, known as the Trial of Anthony Burns. Burns had escaped from a Virginia slave owner two months earlier and had been on the run until his arrest. During the eight days he spent at the courthouse, Burns became a focal point for the slavery debate, and abolitionists tried to stop the federal government from returning him to slavery. Public support for the abolitionists in Boston was strong, but the federal government ordered that Burns be sent back to slavery under the terms of the Fugitive Slave Act. It was a struggle for the soul of Boston. ``Must I go back?'' Burns asked abolitionist Wendell Phillips, who blamed Boston: ``Burns, there isn't humanity, there isn't Christianity, there isn't justice enough here to save you; you must go back.'' -- from The Trials of Anthony Burns by Albert J. Von Frank. Abolitionists attemted to free Burns by storming the Court Square jail. They were unsuccessful. Richard Henry Dana, the most prominent lawyer of Boston's Vigilance Committee, made an eloquent 4 1/2-hour plea for Burns's freedom. Afterwards, Dana was assaulted on the street by pro-slavery rioters. He was unsuccessful. Others tried to buy Burns back from his Virginia owner - they were unsuccessful as well. On June 2, when the decision to return Burns was announced, Boston was under martial law. Abolitionists made Boston a place of mourning. Bells tolled in the city's churches. Black bunting appeared on buildings on Court, State, and Commercial Streets as Burns was led to the docks by Marines and federal marshals. Fifty thousand people lined Boston’s streets to protest the return of Anthony Burns to slavery. 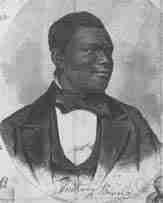 But Burns boarded the ship that took him to Virginia, a slave state. The indicent galvanized Boston and turned politics upside down. The transcendentalists became abolitionists. They honored a higher law than the Constitution, which William Lloyd Garrison called a ``covenant with death and an agreement with hell.'' Ralph Waldo Emerson said, ``Ask not, Is it constitutional? Ask, Is it right?'' Henry David Thoreau urged civil disobedience against ``a government which imprisons any unjustly." Both Thoreau and Emerson wrote and lectured against slavery after the Burns incident. Political parties were destroyed or weakened. Out of the chaos a new party was formed, the Republicans. By 1860, the Republican candidate for President, Abraham Lincoln, carried the state with 63% of the vote.